When performance counts,Backyardblaze.com Delivers. We are the authorized Distributor of the automated remote module (AWEIS). Made in the USA with quality parts this product is designed to perform beyond your expectation. Used in many applications this gives you the control of turning on and off your outdoor fire features with a push of a button. Recently redesigned. 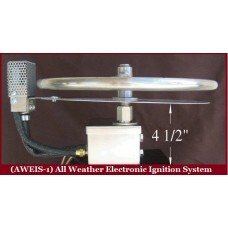 The (AWEIS), All Weather Electronic Ignition System is smaller than ever. place it into those hard to get to places with ease of installation. Improved components to operate with reliability and dependability you will get years of satisfaction from your fire feature. Why Choose the AWEIS system over the competition? Here is one example of the "competitor". 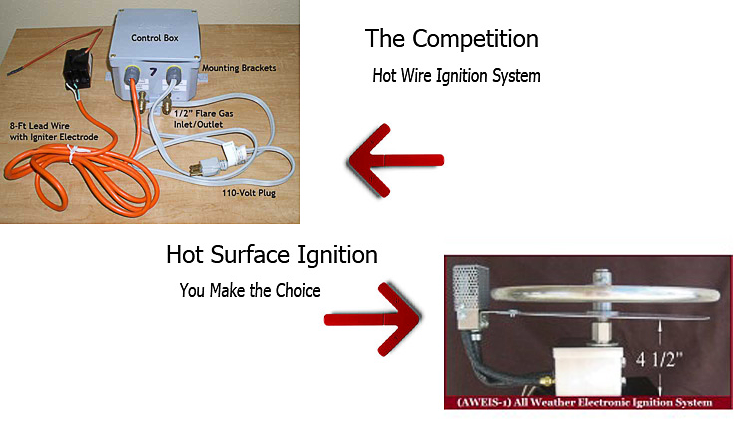 They use hot wire ignition, we use hot surface ignition. Why does it matter? The hot surface stays hot the entire time of operation ensuring no matter what the flame will stay lit! Hot wire would never last the torture tests of you can see in the videos below. That is why we blow the competition out of the water! Ask anyone to provide you with Videos as we do to demonstrate the lasting endurance of Water and High Winds. 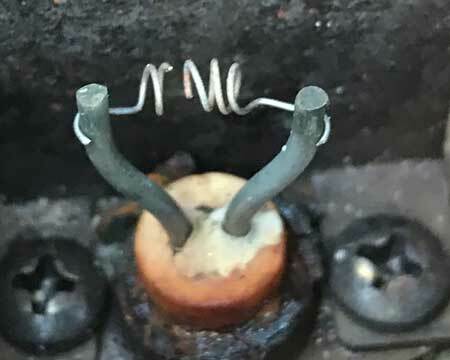 The competition's hot wire ignition system is very fragile and delicate. Below is a picture from a customer who upgraded to our hot surface system.